Alienware is a subsidiary of Dell, producing high-end gaming machines with a vast array of options to suit different budgets. The M17-R1 (£1921 inc. VAT) is the company's mid-range offering, and combines great build quality and design with aggressive performance. The HD 17-inch Super-TFT screen is excellent. It boasts a 1920 x 1200-pixel resolution, making it far more detailed than most screens, providing just about the best picture you'll get in a laptop. The height of the screen makes it equally suited to editing photographs, film or music. Graphical prowess is ensured thanks to two ATI Mobility Radeon HD 3870 graphics cards running in ATI's CrossFireX configuration – a slightly less powerful setup than that found on the Asus W90. Although it features formidable performance – enough for any of the latest games – it can't match the levels of performance set by the Asus W90, which boasts a huge 6144MB of memory. A generic chassis has been used to cut costs, but this doesn't mean it doesn't look good. Matt-black rubber is used in the construction and looks fantastic. Unlike the Toshiba, it's also firm and durable, easily hiding scuffs and fingerprints. The interface features touch-sensitive keys which give instant access to applications. The solid chassis provides an excellent base for the best keyboard in the group. It's quiet and extremely firm, proving a pleasure to game on. It is backlit, so perfect for use in low light conditions, with a choice of blue, red and green lighting options available. The touchpad is large, simple and responsive. A high-end 2GHz Intel Core 2 Quad processor sits within the chassis. This chip ties four processing cores to one die, effectively doubling the multi-tasking capabilities of the other laptops here. Data can also be accessed quickly, thanks to the inclusion of 4096MB of high-speed DDR3 memory. A generous 320GB of hard drive space is also in place, providing room for all your music, films and photos. Portability isn't the laptop's strong point. Nevertheless, 802.11n Wi-Fi is included should you need fast wireless access to the internet. All the usual ports are present and correct, including an ExpressCard, mini-FireWire and HDMI-out, although the use of three USB ports is limited considering the size of the chassis. 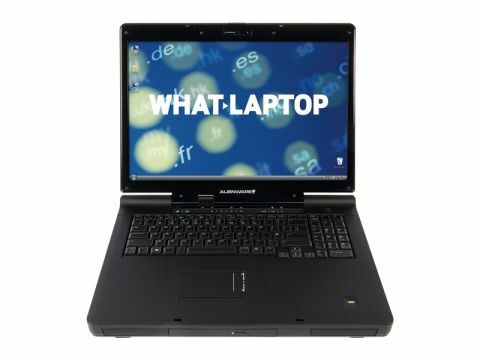 Overall, the M17-R1 is a great laptop which provides plenty of power and usability. It's a pleasure to use, with games running almost flawlessly. If you can afford it, however, we recommend you splash out on the Asus W90, which offers a more complete package.